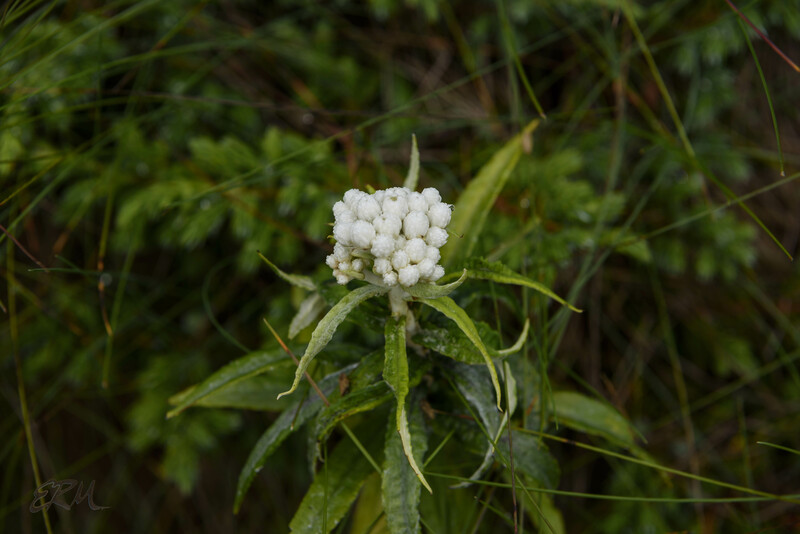 Pearly everlasting (Anaphalis margaritacea; Asteraceae) is found in Canada, New England, the northern Mid-Atlantic, the upper Mid-West, and the mountainous West; in Maryland it’s only in a few scattered locations. 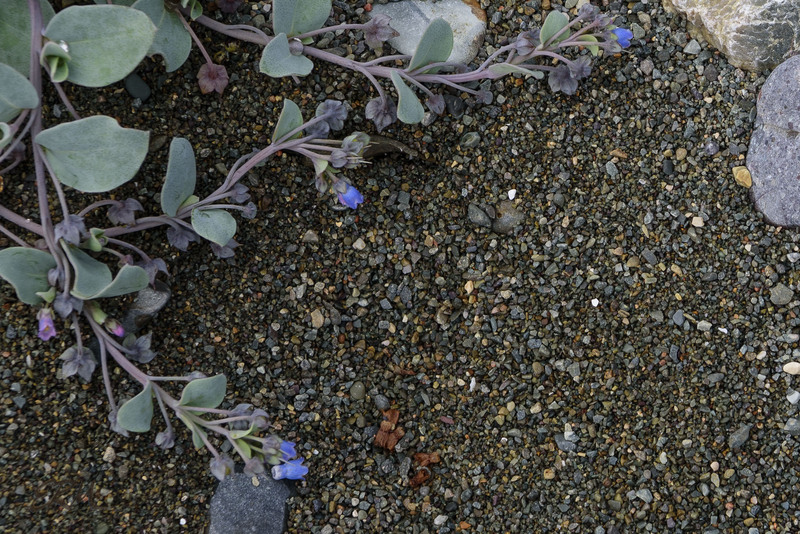 Oyster plant (Mertensia maritima; Boraginaceae) is found on beaches in northern North America and parts of Europe. I found it in Iceland last summer and specifically went looking for it when driving past Birchy Cove. It’s closely related to our showy native Virginia bluebells (Mertensia virginica). 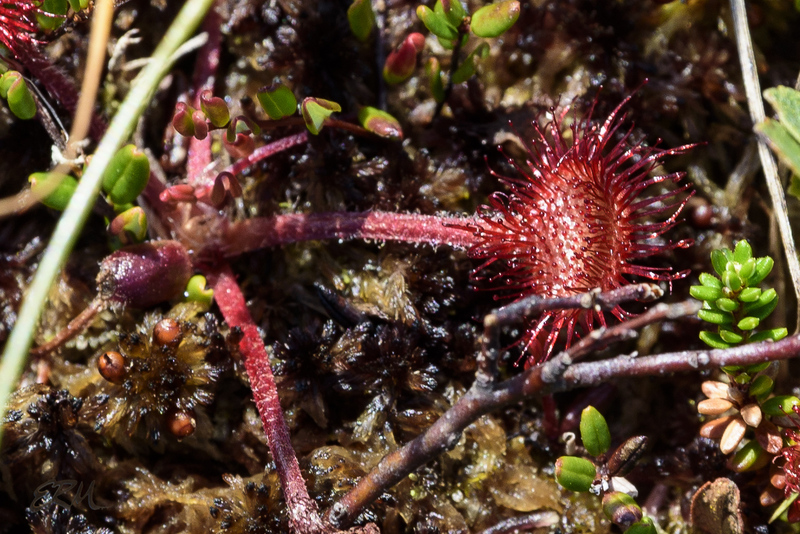 Roundleaf sundew (Drosera rotundifolia; Droseraceae) is a carnivorous plant with circumboreal distribution; in the US it’s found in New England, the Appalachians, the upper Mid-West, scattered locations in the West, Canada and Greenland. In Maryland it’s found in Garret County and parts of the Coastal Plain. Look for it in sunny wetlands (bogs, fens, and so on). 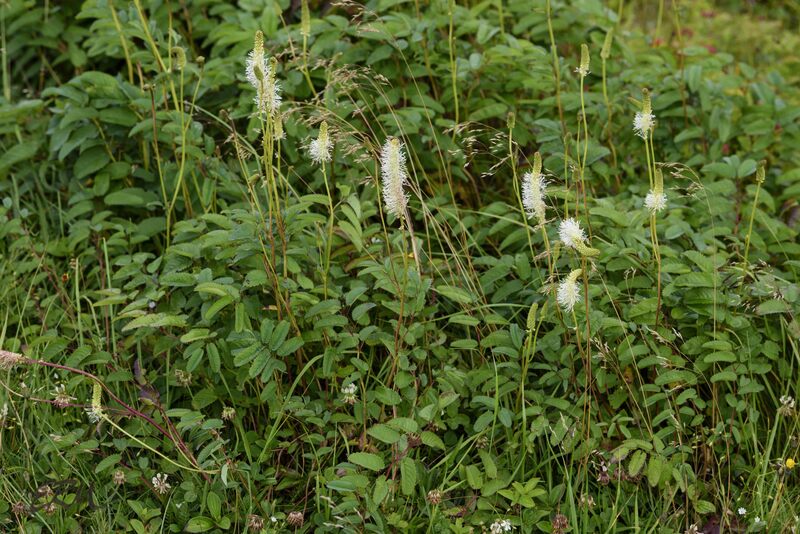 Gall-of-the-earth (Prenanthes trifoliata, formerly Nabalus trifoliatus or N. trifoliolatus; Asteraceae) is found in a variety of dry habitats in eastern Canada, New England, and south through the Appalachians. It’s endangered in Ohio, and though not on the RTE list in Maryland, is only known in Talbot County. Apparently it (and/or other Prenanthes species) was used in folk medicine, and has an exceedingly bitter taste, hence the common name. Scots lovage (Ligusticum scoticum; Apiaceae) grows in rocky areas along the coasts of northern North America and Europe. It’s endangered in Connecticut and New York and special concern in Rhode Island. Supposdely it’s edible, tasting like lovage, which is to say like really strong celery. Striped or creeping toadflax (Linaria repens; Plantaginaceae) is an alien found in only a few spots in North America. 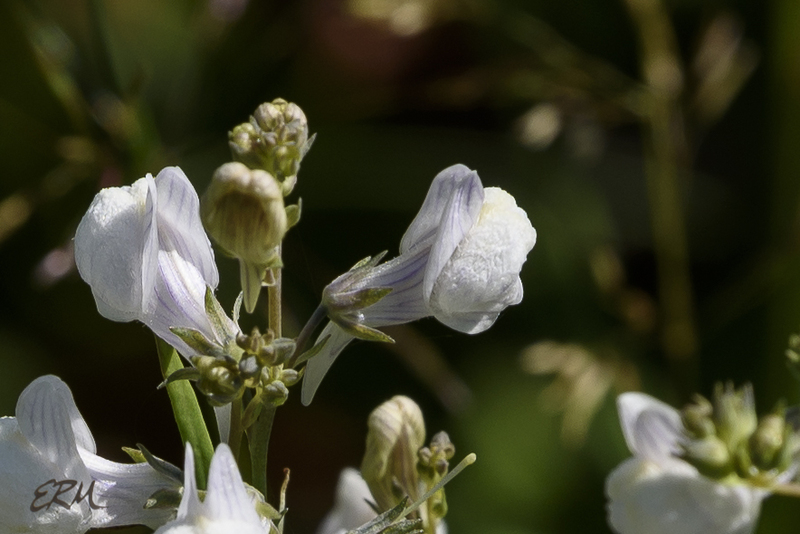 It’s native to Europe, and closely related to the more commonly occurring alien weed known as butter-and-eggs (L. vulgaris). 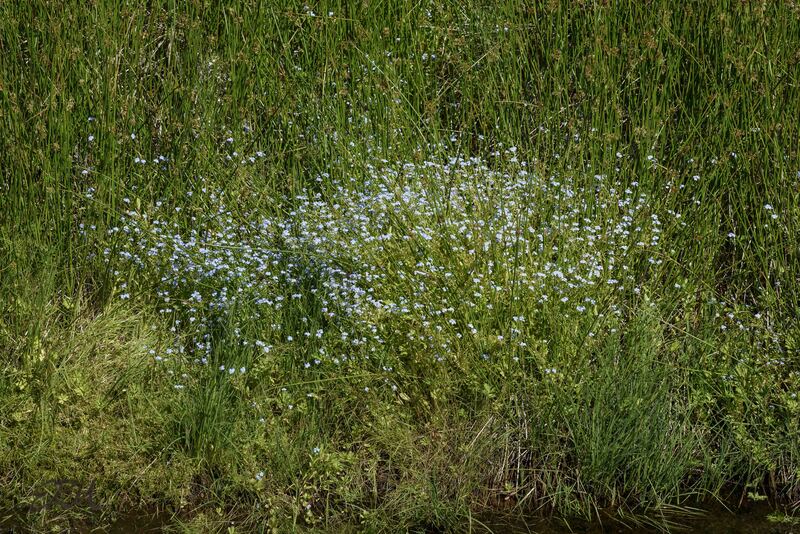 I spotted this Myosotis species (Boraginaceae) and photographed it from a great distance; there was no way to get close enough for a better picture or identification. 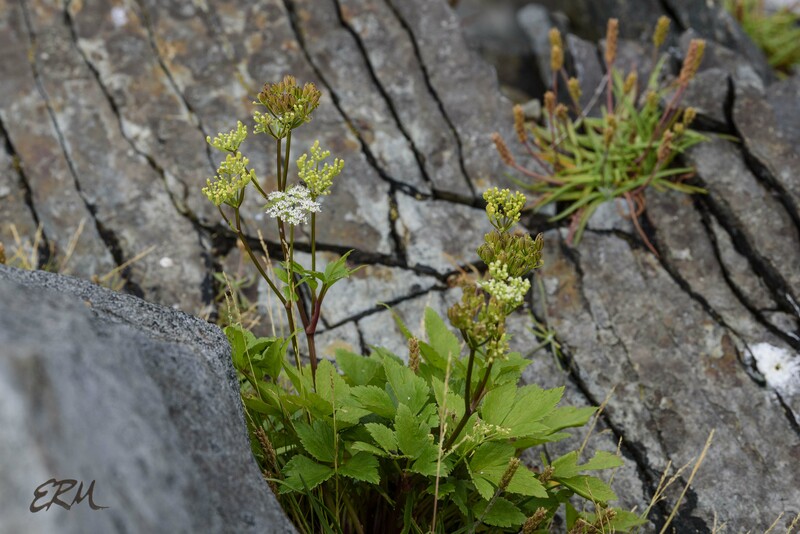 The forget-me-nots are notoriously difficult to identify, as are their close relatives the phacelias, about which I’ve complained many times in this blog. But that borage blue is a beacon. Yellow pond lily (Nuphar variegata, sometimes N. lutea ssp. variegata; Nymphaeaceae) is widespread in ponds across the northern US and Canada; it’s endangered in Ohio. The USDA PLANTS Database shows it present in Maryland but the Maryland Biodiversity Project has no records for it. The closely related spatterdock (N. advena) is found all over Maryland, though, including water pockets in cliffs in the Potomac Gorge. In the same family is fragrant water lily, Nymphaea odorata. As you can see from the picture, I found both species growing together in one of the inunmerable ponds in the center of the Bonavista peninsula. 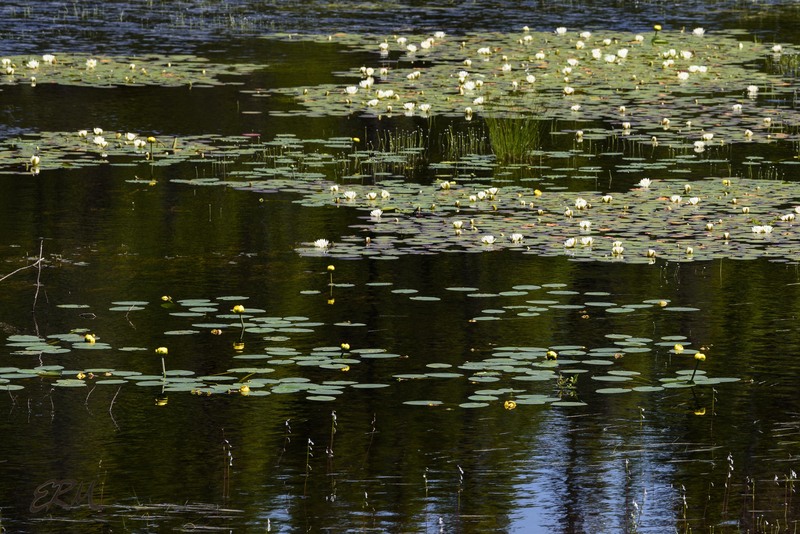 Frgrant water lily can be found in almost every state and province of the US and Canada. American burnet (Sanguisorba canadensis; Rosaceae) is native to the eastern US and Canada as well as the Pacific Northwest; sadly, it’s threatened or endangered in nine states, including Maryland. It’s an eye-catching plant with its tall, fluffy spikes of flowers. 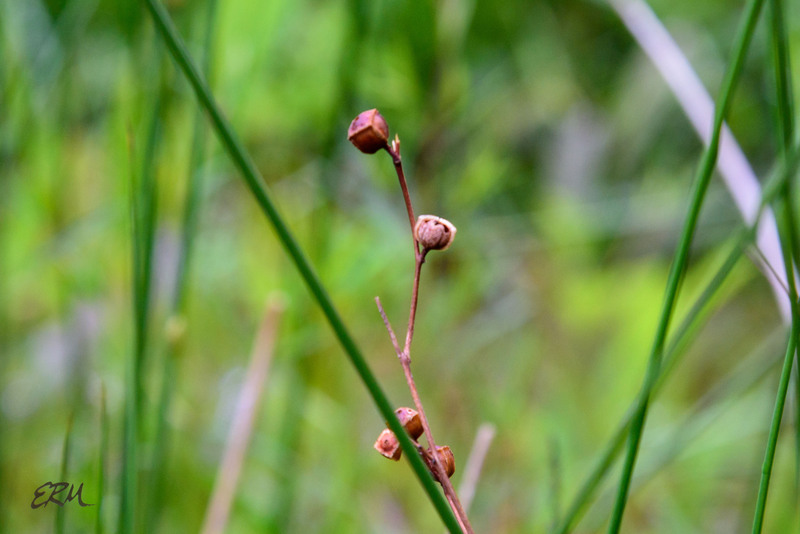 Look for it growing in bogs and other wet areas (including roadsides). 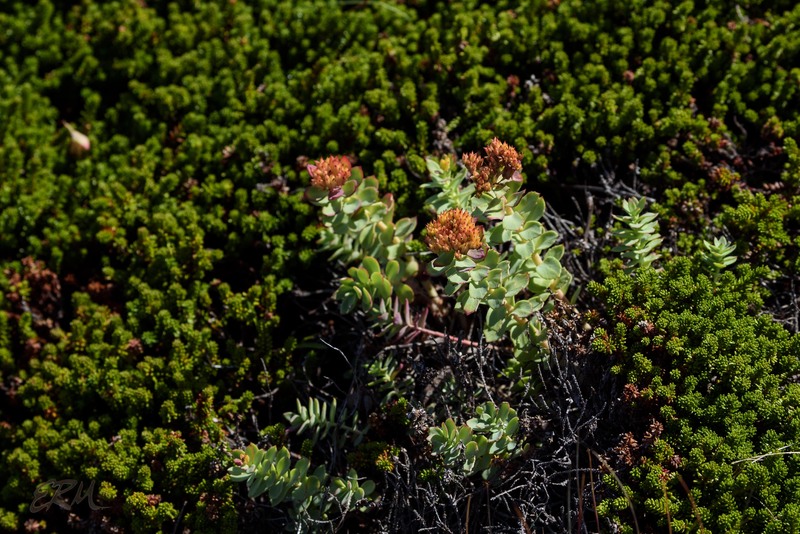 Roseroot (Rhodioloa rosea, formerly Sedum rosea; Crassulaceae) is a subarctic plant found in a few parts of northern North America as well as in Iceland and Europe. I saw this one specimen flowering near Spillar’s Cove and am really kicking myself for not taking the time to get better pictures. One thing or another has kept me away from botanizing in the past few weeks, but recently I did get out for a quick photo shoot along the Billy Goat C trail. I snapped a few pictures of this flower, recognizing it right aways as something in the Onagraceae (evening primrose family), and also knowing that I was probably setting myself up for failure, since identifying plants from photos never goes smoothly. But this one did go smoothly. 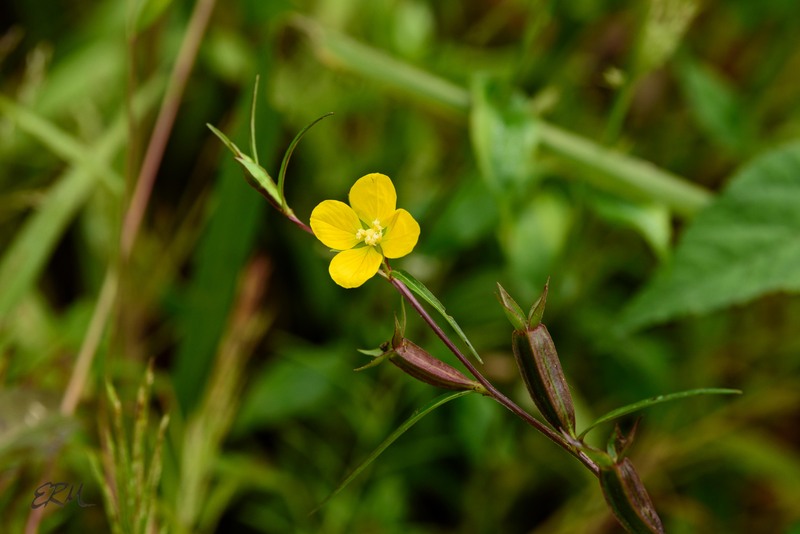 After just a few minutes with Weakley’s Flora I had it identified as Ludwigia decurrens (wingleaf primrose-willow). Then I checked with a few experts on-line, just to be sure, because there are no records for this species in the area where I found it. Two weeks later I found another stand of it about a mile away from the first stand. 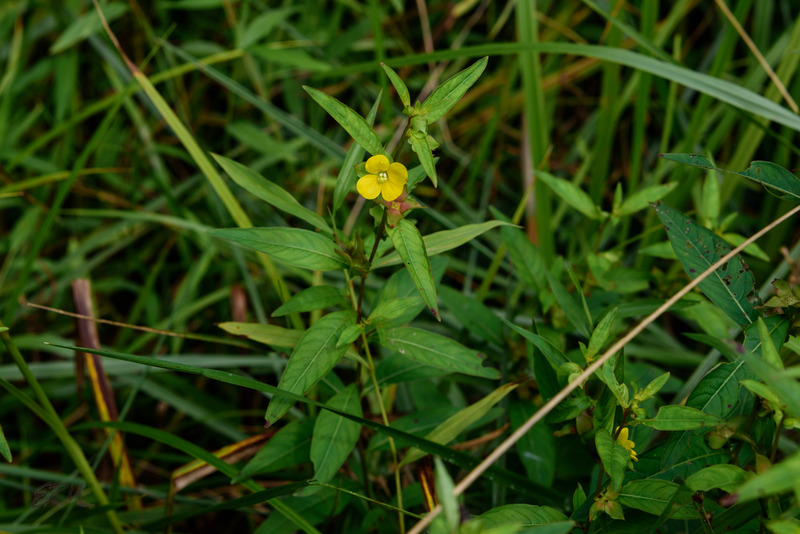 A closely related species, Ludwigia alternifolia, has a similar looking flower, but lacks the decurrent leaves/stems. 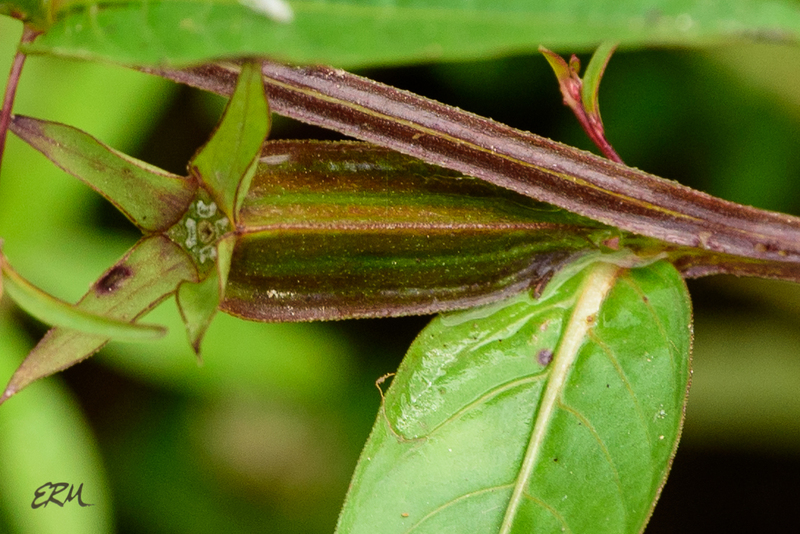 Also, the capsule is cube-shaped, a characteristic that gives the species its common name: seedbox [below right]. 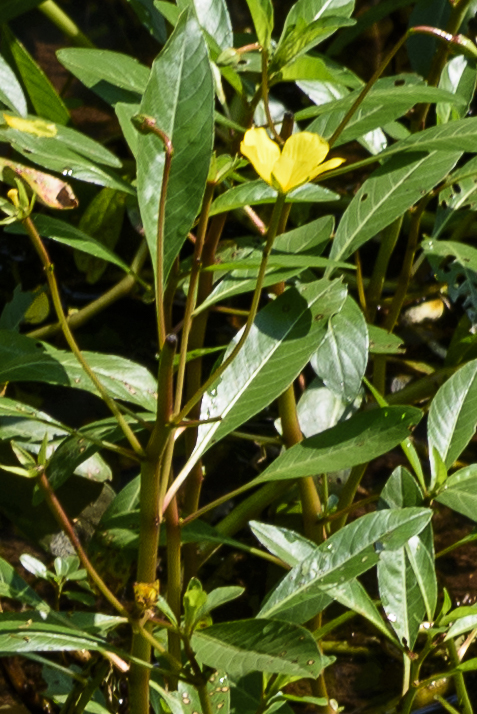 Most of the ten species of Ludwigia found in Maryland are plants of the Coastal Plain, but these two are also found in the Piedmont, along with two others, one of which, L. peploides (floating primrose-willow), I may have found earlier this summer [above left]. However, as the plants were in standing water in the C&O Canal, I couldn’t get close enough to make a positive identification. I couldn’t get close enough to get a decent picture, either. 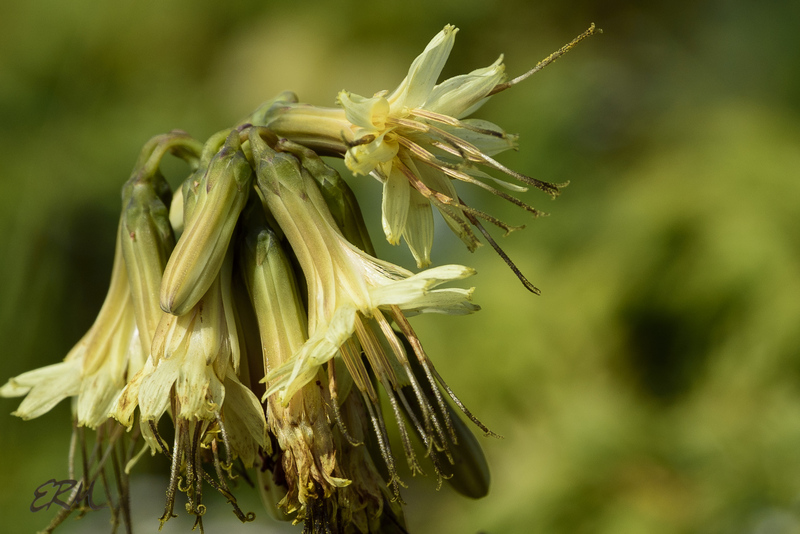 It’s possible that this is the alien species L. grandiflora, for which there are no records in the state of Maryland, but there are records for it in every surrounding state, so who knows.